This post is inspired by my friend, we’ll call her Cassie, as she recently texted me on how anxious she is waiting for a life-changing phone call. There’s anxiety, impatience, worry and excitement all mixed up in her pretty little head. She’s a smart cookie though and believes if it’s to be, it’s to be. She won’t lose sleep, pull her hair out or run around screaming. She’ll keep herself busy knowing things happen for a reason. Cassie may end up reading this and disagree, but my thoughts stand. She’s good at letting things roll. Then I realized, not all of us are that good. We worry, panic and freak out. I am not excluded from this bunch although I’ve learned to handle stress and emergencies fairly well. Over 7 years ago, when life took a nasty turn, I placed a great deal of affirmation statements and positive messages all over my work desk. When things go downhill at work, I’m surrounded by constant reminders to keep my head from rolling off. It centers me, forces me to take a long deep breath and press on. At the end of this post is an image which I’ve given to many co-workers. I cannot claim credit for the words, only the design. I’ve had it so long, I have no clue who to throw credit to. If you find it, please let me know. It’s about worrying. We place a lot of energy on worrying about things that haven’t happened yet. Will I pass this test? Will I get this new client? Will I be accepted? Will she like me? We worry about the future not the past since we know what’s happened then. We fear the unknown and its effect on us. In Cassie’s case, she’s unsure what the decision will be. Will it be in her favor or not? Either way, she wins because things happen for a reason right? We need to trust that good things will find us no matter what, even if its an outcome we weren’t envisioning. I say this like it’s easy. “Just stop worrying!” We want the best for our lives, so we worry if we’ll get it or not. I’ve been working on surrendering to my Higher Power every day and it’s not easy. Whether you call it the universe, spirit or God, in my opinion, there’s many things out of my control. Worrying never makes it better. It just makes you tired and your icky energy just passes on to others. Minimizing worrying can happen, you just have to work at it. A wonderful path has been laid down for you and you’ll see it in time. Good things are right around the corner. It’s not uncommon to remind yourself of these points every day. 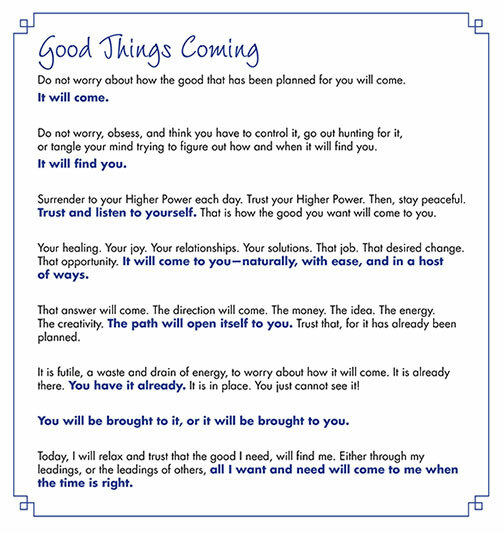 Print out the Good Things Coming reminder and may it aid you in minimizing your worry habits. It’s worked wonders for me. Carnegie is an EXCELLENT choice for positive life change. His information is timeless. Great share Joe!